The issue of so-called alien plant species invading natural woodlands from our gardens has had a lot of publicity in the last few years. There are concerns that common garden trees originating from Europe, China, or other countries, may produce seeds that escape into surrounding areas and grow at the expense of our beautiful native plants. 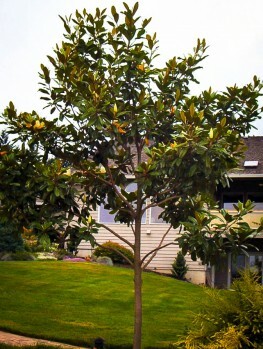 Some states have even placed some popular garden trees on lists that prevent them being grown. The protection of our natural environment is an issue for many people and these concerns have added a new consideration when choosing plants for your garden. The simplest and best way to deal with any concern you may have on this subject is to make your tree choices from the extensive range of native trees we stock at the Tree Center. That way you will be adding to, rather than perhaps threatening, the natural areas around you. Even in an urban area it makes sense to contribute to the total number of native trees, especially when they may be threatened by the very urban development that has given you your new home. So when it comes to choosing shade trees and privacy trees for your garden, choosing native American species makes a lot of sense. These trees are adapted to our climate regions, ‘fit in’ visually and are suitable food and nesting sites for native birds, insects and butterflies and other native animals. They are also often spectacularly beautiful – people travel thousands of miles to see the display of our native maples, oaks and ash trees that set the forest ablaze every fall with their spectacular oranges, reds, purples and yellow tones. So first, let’s look at some native trees that are great choices for both shade and fall color. Top of the list has to be the Sugar Maple, Acer saccharum, which is the main forest tree of the north-east, throughout New England and up into Maine and Canada. In the wild trees can reach 80 feet or more in height, but in gardens 40 to 50 feet is the more usual final height, with trees growing wider but shorter than they would in a forest. 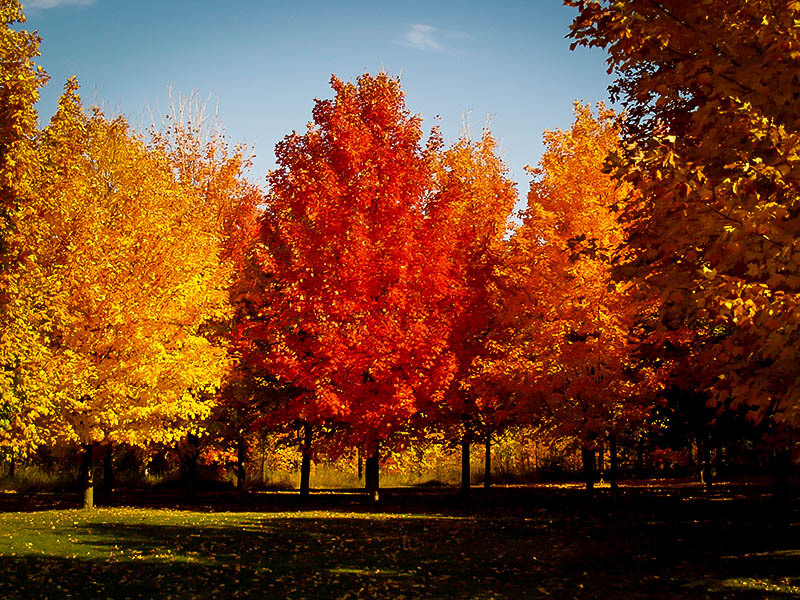 Visitors flock to see these trees with their spectacular fall colors of gold, orange and red. The colder your region, the more spectacular your tree will be, since a combination of mild days and cold nights is needed to develop the richest colors. Sugar Maple will grow in most soils, but does best in deeper soils that have a good organic content and are moist for much of the year. However it will not grow in soil that is constantly wet. Planted as a young tree already 5 to 6 feet tall it will grow quickly and provide a cool, green shade all summer long. Less well known, but even more spectacular is the American Red Maple, Acer rubrum, which grows in similar area to the Sugar Maple but turns a solid brilliant red in fall, without the yellow tones of its brother. 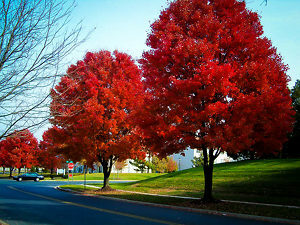 Since the color development can be variable in this species, we also sell selected forms, like the October Glory Maple, which has been developed to give the strongest and most vibrant colors every year, while still being a fully-native tree, with a full wild set of genes that cannot damage local populations of the tree. 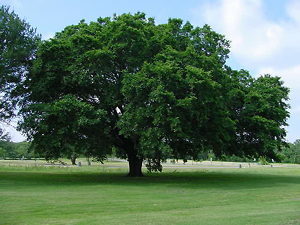 Oak trees are also native to large areas of America. The fall display in the north east enjoys the variety provided by the Red Oak, Quercus rubra, a native that makes a wonderful shade tree and is a fast growing tree compared to many others. Oak trees are always associated with long life and if you want to plant a tree that could be around centuries after you are long departed, plant a White Oak, Quercus alba, with a life-expectancy of 500 years or so. Of course you won’t have to wait that long to enjoy the beauty of its rich chestnut tones in fall, or to see migratory birds and wild turkey feasting on its acorns. Planted in the lawn you will need a little annual clean-up, but the elegant form and deep shade it casts will repay you well. 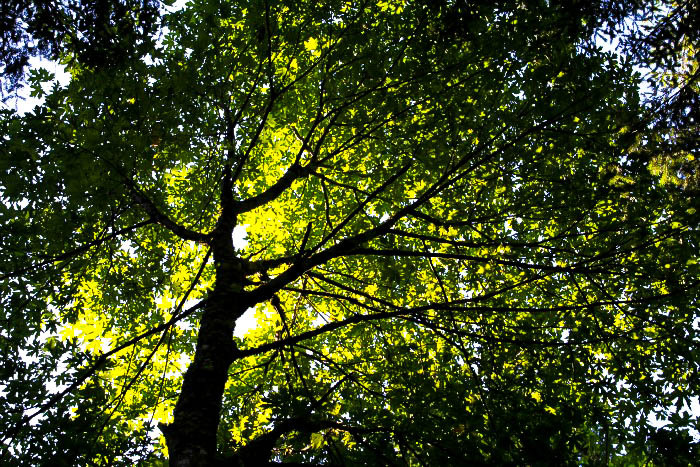 The restoration of the American Elm, decimated by disease some decades ago and lost from the streets of small-town America, is a worthy project for anyone environmentally-minded. New forms of this iconic tree are available with better disease resistance and this tree is perhaps the perfect shade tree, with a high crown above a stout trunk. Choose this native tree and help re-build a lost past. 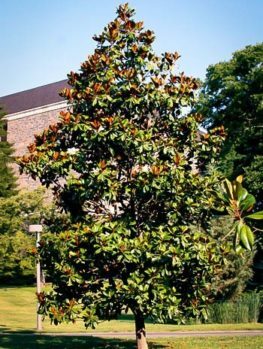 Moving south, a spectacular evergreen tree for warm climates is the Southern Magnolia, Magnolia grandiflora, which grows wild from southern Virginia into Florida and west to eastern Texas and Oklahoma. 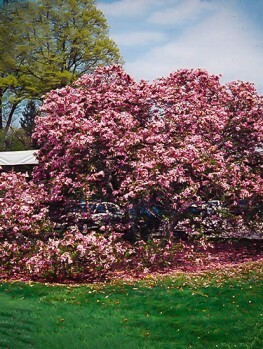 It will also grow in gardens in slightly cooler areas and some hardy varieties, such as Bracken’s Brown Beauty Magnolia, will grow as far north as Long Island. 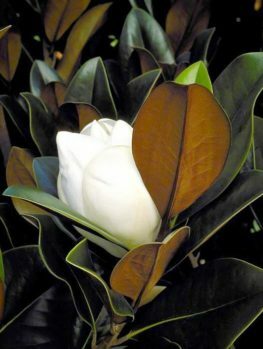 At the Tree Center we carry several other improved varieties that will not adversely affect local populations, such as the slightly more compact Blanchard Southern Magnolia or the exceptionally hardy Edith Bogue Southern Magnolia, with larger flowers up to 12 inches across with a higher petal-count than wild trees. 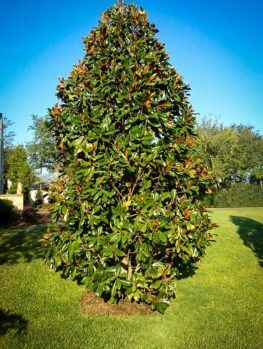 The Southern Magnolia needs a little pruning to develop a trunk if you want to use it for a shade tree, as it naturally keeps it branches low down until quite mature. This of course is an advantage if you want to use this as a privacy tree, plus, being evergreen, as a screen it will give you all year round cover. The main attraction of these trees is their beautiful large, deep-green and glossy leaves, with a brown ‘felt’ on the underside. 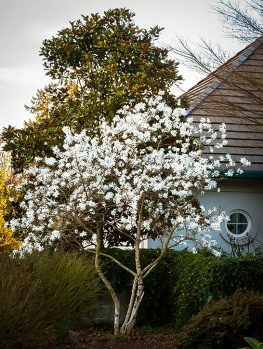 In early summer the enormous sweetly-scented white blooms open all over the tree, followed by more scattered blooms all summer long. In warm areas these will be followed in fall by the fruits, which look a little like fir-cones, but split to show large bright-red seeds. 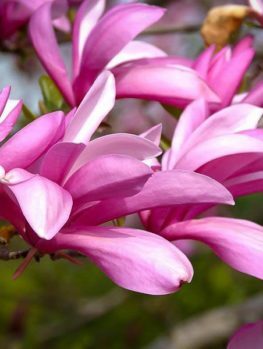 Whatever variety of the Magnolia tree you choose, should seeds escape into the wild they will only add to local populations. A very different evergreen native, that makes a great shade tree, privacy tree or specimen, is the Bald Cypress, Taxodium distichum. This is the ideal choice if you have wet soil, since it will grow happily even standing is shallow water, like the swamps of the south it calls home. Surprisingly, this tree is also drought-resistant and will grow in ordinary garden soil as well as by a stream. If you have low-lying areas subject to spring flooding, but dry in summer, this tree is the perfect choice. It is called ‘bald’ because unlike almost all other needle-trees, this one drops its leaves in winter, after they turn shades of yellow, rich orange and red, making a beautiful display among other evergreen trees. This is just a selection of the native plant material we have available, so check our site for other possibilities for shade, hedges and flowering shrubs too. 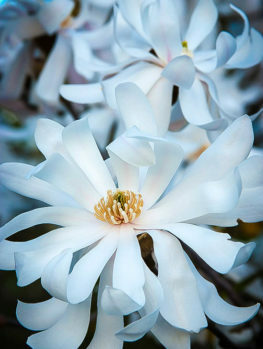 Remember that any shade tree, exotic or native is a long-term addition to your garden, so choose carefully, considering your climatic zone of course, but also the space needed to allow your tree to mature, obvious things like overhead utilities and underground pipes, as well as the visual impact your choice will have on your own and neighboring gardens. So if you are nervous planting exotic trees, since some may have the potential to escape into the wild, choose instead from our extensive range of native trees, suitable for all climates, soils and growing conditions. That way you can add to the pool of native trees and do you part for the environment while still enjoying shade, privacy and beauty. No matter if you garden in the country or in the city, with a suitable native tree from the Tree Center, you can never go wrong.